The British Minister of State for the Commonwealth and the UN and the Prime Minister’s Special Envoy on Freedom of Religion or Belief, Lord Tariq Ahmed of Wimbledon, received in his office today the Ambassador of the Kingdom of Bahrain to the United Kingdom, Shaikh Fawaz bin Mohammed Al-Khalifa, as well as the Chief Executive Officer of the Labour Market Regulatory Authority and Chairman of the National Committee to Combat Trafficking in Persons, Ausamah Abdullah Al-Absi. 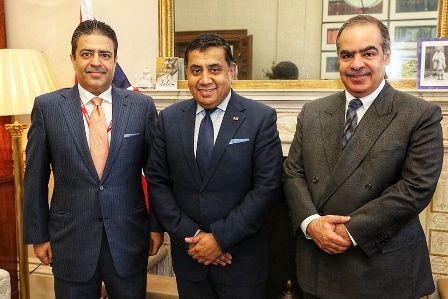 Lord Ahmed hailed the achievements of the Kingdom of Bahrain in the field of combating trafficking in persons and for reaching Tier 1 in the United States Department of State Trafficking in Persons Report in 2018. He also praised Mr. Ausamah Al-Absi for being honored as one of ten outstanding individuals by the US Department of State for his efforts in combating human trafficking. Lord Ahmed also thanked the Embassy of the Kingdom of Bahrain, namely the Ambassador, for cooperating to help coordinate such visits that reflect the Kingdom’s efforts in the field of combating human trafficking. For his part, Ambassador Shaikh Fawaz bin Mohammed Al-Khalifa stressed that the Kingdom of Bahrain promotes the concept of human rights through several procedures and legislation that aim at ensuring human rights protection and development. He added that the Kingdom of Bahrain has established intuitions and committees that monitor and protect the implementation of these legislations. He continued that these are among the Kingdom’s achievements under His Majesty King Hamad bin Isa Al Khalifa, affirming his hopes for the continued coordination between the two countries to exchange experiences in this field. Mr. Ausamah Al-Absi reviewed the current main developments in the Kingdom, presenting a summary of the most important achievements in the Kingdom of Bahrain through a number of measures implemented and laws enacted recently, including flexible permits. He also reviewed some of the pioneering projects in the region and the world, such as the launch of the digital platform of the National Referral Mechanism for Victims of Trafficking in Persons and the launching of the regional training and capacity-building center to combat trafficking in persons, in addition to some future projects and programs that would strengthen the fight against human trafficking in the Kingdom of Bahrain.